Too often we see urgent requests on social media asking for pet blood donors to save the life of another who is losing blood. For some, it even comes as a surprise that blood transfusion could be applied to animals. Why might my pet need a blood transfusion? Where does the blood come from? How are suitable blood donors selected? What is the process like and what are some of the complications / reactions my pet might have? 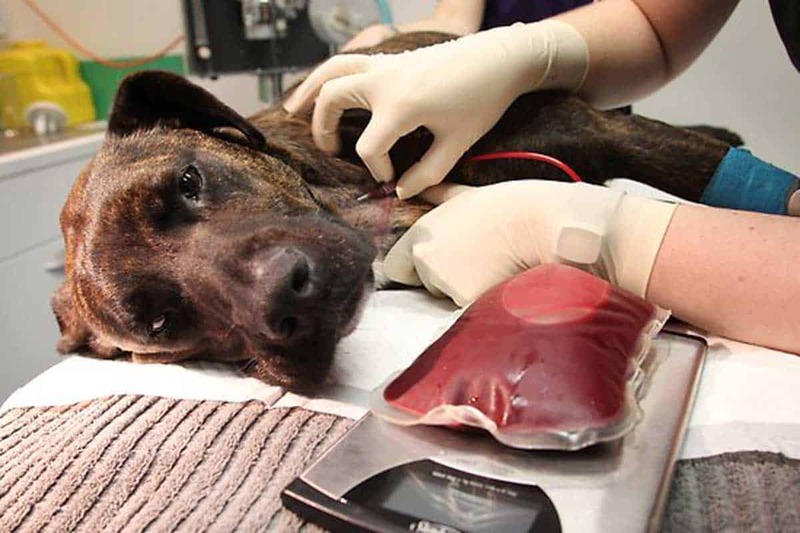 Find out more about canine blood transfusion here. In general, the decision to transfuse blood isn’t based solely on the haematocrit, the percentage of blood volume that is made up of red blood cells. Vets usually consider several factors when deciding whether to administer a transfusion, these often include clinical signs, degree of compensation and chronicity of the condition. For example, in an accident resulting in acute haemorrhage, the haematocrit can fall to less than 25% in a short period of time, thus an urgent need for transfusion. However, in chronic kidney failure, a transfusion is rarely needed even when the haematocrit reaches a value of 15%, as these patients are usually able to compensate. How are suitable blood donors screened and selected? Before becoming a blood donor, all animals are screened for infectious diseases and are given a full veterinary exam to ensure that only healthy dogs and cats enter a donation programme. Fit, healthy donors are selected to ensure the blood they provide is of best quality and also that the process is not detrimental to the donor. Blood donors should be healthy young animals, weighing at least 25Kg. They should be up to date with vaccinations, have not received any transfusions and are free of blood-borne diseases. In addition, they should not be taking any medication at the time of donation, other than flea/ tick prevention, routine worming medication and heartworm preventative. Screening tests for donors typically include blood typing, haematology and biochemistry profiles, as well as checking for blood-borne parasites, such as Babesia, Ehrlichia, and Anaplasma. Blood transfusions can be given as a fresh whole blood sample or as a component of blood (i.e. plasma). Each of these have different purposes, and the choice of blood product should be tailored to the patient’s needs. Fresh whole blood: this is blood that is not separated into its various components. It is a good source of haemoglobin, clotting factors and platelets. Plasma: this is the component of blood which contains albumin, globulins, clotting proteins and anticoagulants. The first step in a blood transfusion is to determine your pet’s blood type. Once the blood type has been established, the next step is to find a donor. To ensure compatibility, blood typing and crossmatching of both recipient and donor need to be done. Dogs, like humans, have blood groups and are typed under the Dog Erythrocyte Antigen (DEA) system – DEA 1.1, DEA 1.2, DEA 3, DEA 4, DEA 5 and DEA 7. A new erythrocyte antigen, Dal, has been identified but its clinical significance is currently unknown. Dogs which test positive for DEA 4 only are considered universal donors. Although complete blood typing at a commercial laboratory can be used to identify universal donors, this is often not done during emergencies as it is not very practical. Rather, in-house blood typing kits are used instead. These kits are readily available, and only test the most antigenic type system, DEA 1.1. 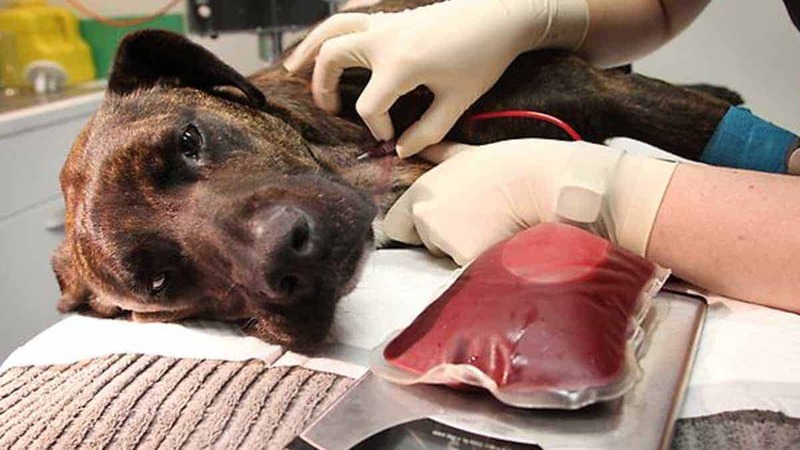 A first time blood transfusion can be performed using DEA 1.1 negative blood, as dogs do not have significant antibodies against other blood groups unless the patient has had a previous transfusion. Adverse reactions are therefore unlikely, but the recipient will produce antibodies against the donor’s blood group in the next few days post-transfusion, which necessitates compatibility testing prior to subsequent transfusions. The recipient has had a previous blood transfusion. There is a history of transfusion reaction. The recipient’s transfusion history is unknown. The recipient has been previously pregnant. There are two types of crossmatching – major and minor crossmatching. Major crossmatching checks if the recipient’s plasma has antibodies to the donor’s red blood cell antigens, and minor crossmatching checks if the donor’s plasma has antibodies to the recipient’s red blood cell antigens. If haemolysis and/or agglutination occur with major crossmatching, the transfusion cannot be performed. On the other hand, if haemolysis and/or agglutination occur with minor crossmatching, the transfusion can still be performed, but requires stringent monitoring. This is because even if the donor has antibodies to the recipient’s red blood cell antigens, the quantity present in the transfused blood does not usually confer a serious risk. What reactions might occur in a blood transfusion? Delayed reactions, on the other hand, occur more than 24 hours post-transfusion and include haemolysis, jaundice and purpura. Despite using blood products from a compatible donor, it is still possible for transfusion reactions to occur, thus monitoring is crucial during and after administration of blood products. Known side effects include the feeling of being pampered, receiving treats, and a tail that is wagging non-stop. How can my pet become a donor? Although the concept of veterinary blood banks has been developed over the past 15 to 25 years, there is no such facility in Singapore. To deal with the shortage, veterinary centers in Singapore rely on Community-based donor programmes where staffs and volunteers regularly bring in their pets for blood donation. Some of these veterinary centres include The Joyous Vet and Jireh Vet. Benefits to volunteers can include free annual health exams and blood work, heartworm prevention and food. Some programmes may even offer a return gift of blood at no cost if the donor ever needs it during his or her lifetime. Donor dogs and cats can “roll up their fur sleeves” every 2 to 3 months. If the dog has a calm temperament, sedation is not required—just plenty of head rubs and treats. The blood draw takes about 15 minutes. A single donation can be used to save up to two lives, because the blood can be separated into two components, red blood cells and plasma. With people, donating blood is sharing the gift of life with those in need, and the same holds true for our pets. In the case of canine and feline donations, a person’s pet can save the life of another. Animals, they can be heroes too. Interested in having your pet become a donor? If you live in Singapore, contact The Joyous Vet at 6769 0304 (Chua Chu Kang) / 6267 4137/8 (Yuan Ching), or Jireh Vet at 6556 0268, or alternatively ask your veterinarian. Davidow, B 2013, ‘Transfusion medicine in small animals’, Veterinary Clinics of North America, no. 43, pp. 735-756. Fragío, C, Daza, Á 2013, ‘Small animal blood transfusions – a practical guide’, Veterinary Focus, vol .23, no. 1, pp. 24-31. Hopper, K 2015, ‘Blood product administration’, The Vet Education Online Veterinary Conference, pp. 1-8. Prouix, A, Waddell, LS 2012, ‘Blood transfusion basics’, NAVC Clinician’s Brief, pp. 66-69. Wardrop, KJ, Birkenheuer, A, Blais, MC, Callan, MB, Kohn, B, Lappin, MR, Sykes, J 2016, ‘Update on canine and feline blood donor screening for blood-borne pathogens’, Journal of Veterinary Internal Medicine, no. 30, pp. 15-35.